The workshop will have two sessions. 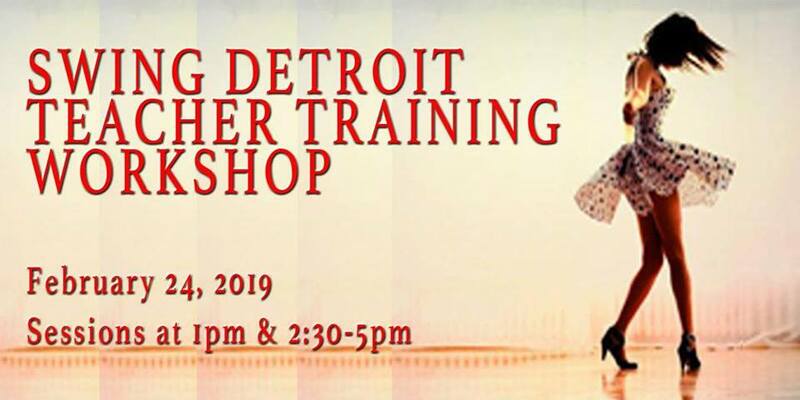 The first is a “Train the Trainer” workshop for current Swing Detroit teachers to have an opportunity to share best teaching practices, ask questions, share your ideas in a collaborative environment. The second session, starting at 2:30, is for ANYONE who is interested in teaching swing dance, but who has little or no prior experience. Attendees will essentially go through a how-to workshop. We will give you step-by-step processes for teaching a dance class, including a syllabus covering both East Coast Swing and Beginner Lindy. Those who successfully complete this session will be eligible to begin co-teaching for Swing Detroit (and teaching solo after that, if desired). The workshop is ALSO OPEN to dancers from other clubs who may want to take the information back to their own scenes. Both sessions will be moderated by Paulette Brockington. Paulette is a Michigan Arts Educator of the Year, a decadelong Frankie Manning mentee, and a former swing dance teacher at Herrang Dance Camp in Sweden. She currently hosts a Thursday evening swing dance lesson and social in Midtown Detroit, as well as serving on the advisory board for Swing Detroit. Cost for this first-ever workshop is $20. Pre-registration is appreciated.